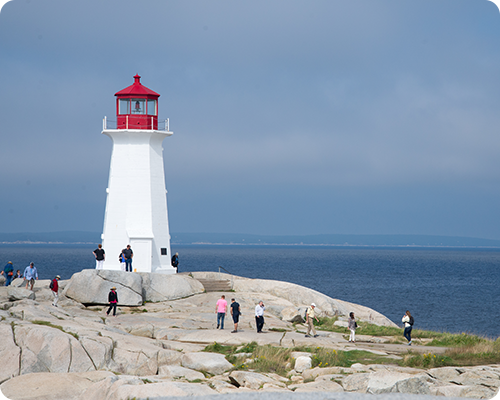 After our time in Prince Edward Island we headed across the water to Halifax, Nova Scotia. We stayed right downtown and spent an entire day walking around exploring the city. It was very much in contrast to what we had been doing a few days before - wandering on sandbars and collecting hermit crabs - but it was good. One of the best things about this entire trip is that it was a good mix of seeing things and relaxing, city and country, driving and walking...we got the balance just right. 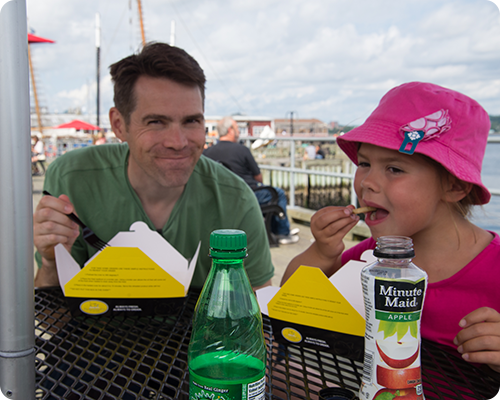 The waterfront in Halifax was a bustling place full of restaurants (so many) and shops. 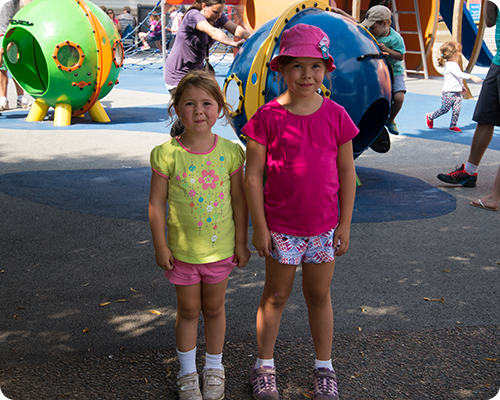 There was also this huge playground which the girls loved and which we visited several times during our time in the city. 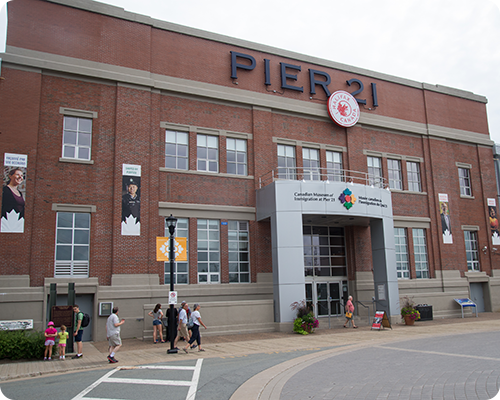 A visit to Pier 21 - the historical point of immigration for those coming to Canada - was more emotional for me than I thought it would be. My grandfather came to Canada through Pier 21 over 50 years ago and as I wandered through the museum, reading the words of the immigrants who came to this country looking for a better life for themselves and their families, and hearing about the loss they felt having to leave their home country and life behind, I felt thankful and honored....and very proud to be a Canadian. One of the things on our 'to do' list for this trip was to have fish and chips on the Halifax pier....which we did in the company of many aggressive pigeons and seagulls. And no trip to Halifax would be complete without a visit to Alexander Keith's Brewery. 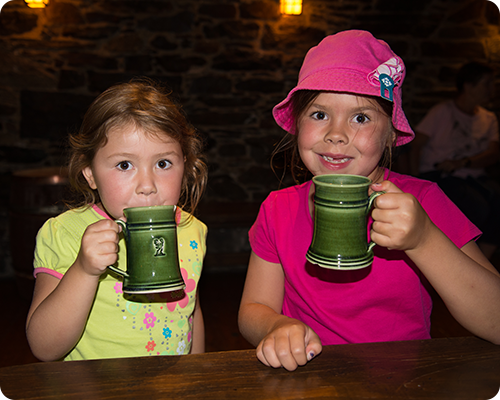 The brewery tour was incredibly animated which the girls loved, and I love this picture of them in the tasting room. Fear not, they are drinking lemonade not beer, just out of beer steins, for a more authentic pub experience. 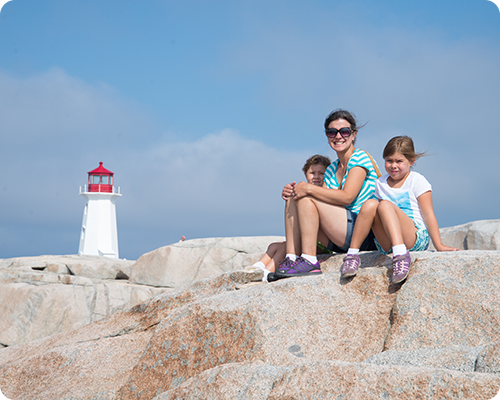 On our second day in Nova Scotia we visited the world famous lighthouse at Peggy's Cove. Again the weather was incredible and we spent hours climbing over the rocks, staring at the sea, listening to the waves, and taking an insane amount of pictures. The girls absolutely loved scampering over the rocks, Bridget preferring to find the most difficult path that involved the most climbing. I'll be honest, I was a little nervous watching them on the rocks and had to take a deep breath to relax, telling myself to just let them go and explore. And we almost made it through the entire day without someone falling until Claire tripped on the way back to the car and did a number on her knee, poor thing. 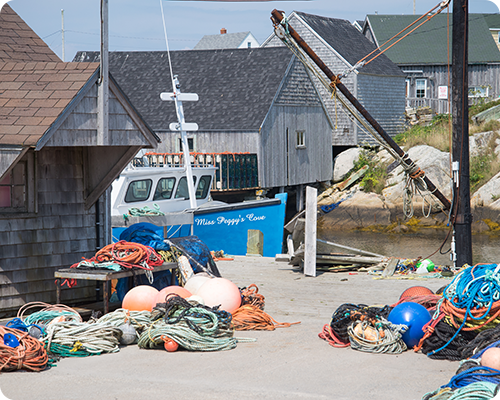 We walked around the village too, which is quite small and full of fishing paraphernalia. There was this one little shop that had vertebrae and the jawbone from a whale....weird, but very interesting to see. 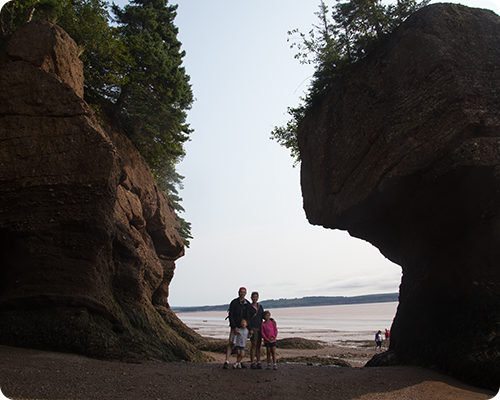 Leaving Nova Scotia, we headed to New Brunswick where we visited the Bay of Fundy, home of the highest tides in the world. 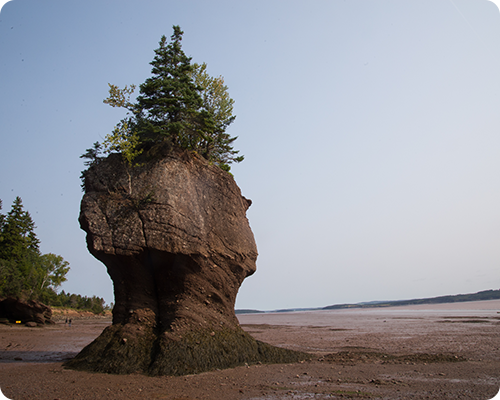 Walking on the muddy ocean floor at low tide was absolutely incredible - there were caves to explore and rocks to climb on - not a rock could be passed by without someone climbing on it. 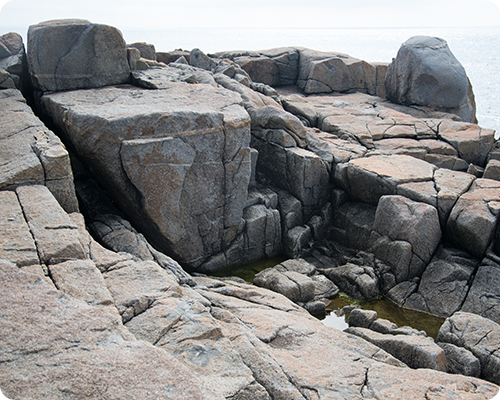 But what was even more incredible was seeing the tides come in, and knowing that only a few short hours before we were standing where there was now several meters of water. 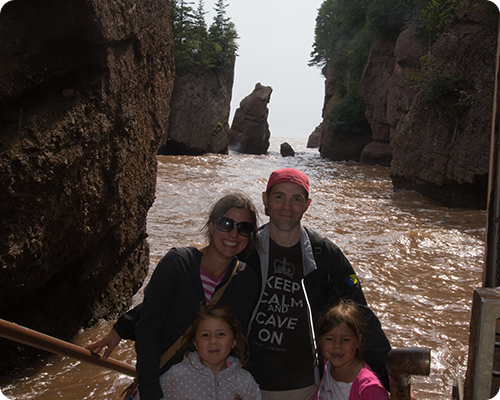 There are stairs you go down to walk on the ocean floor at low tide, and here is us posing for a picture at the base of those stairs at high tide, the water splashing aggressively against the rocks, the amazing power of nature on display. And then it was time to head home. Steve drove, the girls drew pictures and read comic books, and I crocheted. We listened to the soundtrack from the Anne of Green Gables musical (Taylor Swift had been banned due to extreme over-playing on the drive out), stopped for gas, coffee and Timbits (so many Timbits were eaten on this trip, I am certain we are done with those for a while)....and touched down again at home with some incredible family memories we'll treasure forever. 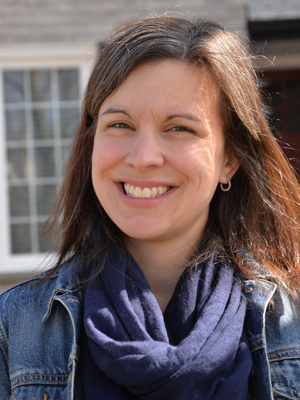 Thanks so much for reading another very long post. Hope you enjoyed it. Head here to read about the first half of our holiday.